Hello again, all you familiar faces! First, thank you so much for being a part of history by supporting GaymerX – our first convention wouldn’t have been so successful without you. We’ve been working on the GaymerX2 Kickstarter and on building something even bigger from the foundation you’ve helped us build. We want to take everything we did right the first year and build on that to make this event even bigger and better than the last! So what’s a gaming convention without… the games? With help from Cards Against Humanity, we’ve got IndieCade bringing in awesome games you might not see anywhere else, curated from the world’s most prestigious games creators. Not only that, but we will have several games rooms for board games, card games, tabletop RPG, and tournaments a-plenty! We’ve also got some of our friends from the first GaymerX returning, like Ellen McLain and John Patrick Lowrie who made us the hilarious video above! Not only that, but we’ve got new guests like WWE superstar Darren Young, and the ultimate Gaymer: Xander Jeanneret, finalist from King of the Nerds! Check out this awesome video he made us! We’re bringing back a lot of the fun you had at the first GaymerX! That means games, panels, parties and COSPLAY! 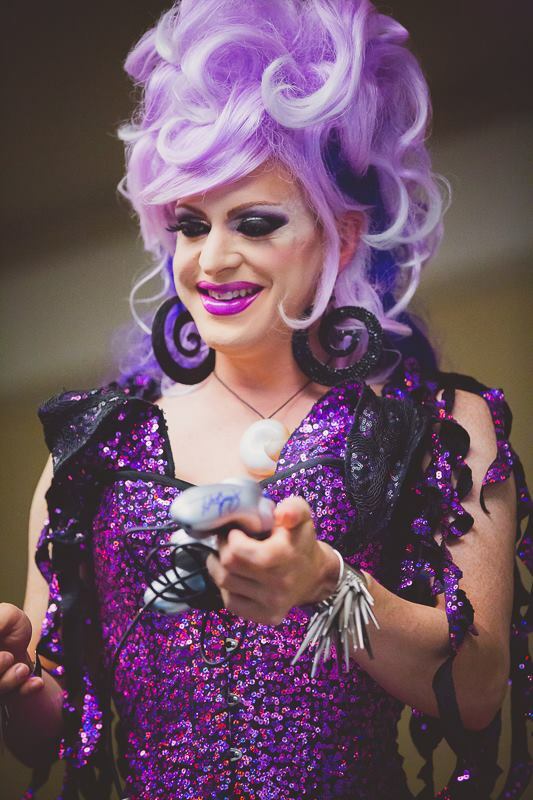 How fun can a convention be without cosplay, crossplay, and even a drag cosplay of Ursula from The Little Mermaid? No fun at all! That’s why we’re making our cosplay pageant even bigger and better this year! And if that wasn’t enough, to encourage people to don their wildest regalia, we’ve added a $1,500 prize pool to the best costumes in the show! But don’t think that this is all we’ve got for you! Far from it! We’ve still got plenty of awesome surprises for you and as we meet our goals we will unlock more and more! So back our new Kickstarter and follow the updates at https://www.kickstarter.com/projects/gaymercon/gaymerx2-everyonegames/posts. We’re nearing the end of our campaign. It’s a race to the finish line and we need your help in finishing strong! Right now is the time when you get to decide just how big we can go so please consider helping out either by pledging or helping spread the word. And for those of you out there who cannot go, this year we’ve made tiers for you to be able to donate tickets through charitable organization GeeksOut who will make sure those gaymers out there who can’t afford it will be able to experience this life-changing event. Please help us make this possible! This week has been an exciting one in that gaymers and queer geeks were mentioned in numerous forms of media – bringing attention to the big question: We know that gaymers exist (and in droves) but where are the queer games – why are video games the last to the party when every other major form of media has made massive progressive strides? I had some really interesting conversations this week some really cool folks in the press who wanted to learn more about what’s going on in the queer gaming world and what we can do to begin moving forward towards some tangable progress towards a world where queers, and those who feel currently left out by the current game culture, can feel like they’re welcome at the big round table. If you’d like some reading material, please check out the below articles that we weighed in on some level, or were articles that I really enjoyed reading this week.